Using the nation’s first model of quarterly charitable giving, the University’s Center on Wealth and Philanthropy predicted that gifts to good causes would turn out to show a drop of 5.3 percent in 2009 but increase in 2010. In response to student importunings, the O’Neill Library created a rear entrance allowing students to enter from the fourth floor of 21 Campanella Way and without winding themselves on the atrium stairs to the middle campus. The Social Security Administration awarded Carroll School professor Alicia Munnell $3 million to promote financial literacy among workers and retirees. The Connell School’s Ann Burgess had her name affixed to an annual award made by the International Association of Forensic Nurses, while the Lynch School’s Audrey Friedman was named “Massachusetts Professor of the Year” in a review sponsored by the Carnegie Foundation. Michael Bourque was named vice president for information technology, joining his brother Dan Bourque, vice president for facilities management, on the president’s cabinet. Three Bourque brothers and four sisters do not yet hold executive positions at the University. William Neenan, SJ, who lent his credence and name to last year’s successful effort to increase the rate of alumni giving (“The Neenan Challenge”), has taken on campus energy usage, appearing with a green upper lip and a bemused smile on a poster for the “Got Green?” conservation campaign. H1N1 vaccine was offered free of change to all employees and students, and some 800 responded positively; campus buses were fitted with anti-bacterial soap dispensers. Setti Warren ’93, and Scott Brown, JD’85, were elected, respectively, to the mayor’s post in Newton, Massachusetts, and to the United States Senate. James Q. Wilson, a leading conservative scholar of American politics, is a visiting fellow at the newly established Clough Center for the Study of Constitutional Democracy. Wilson will teach a seminar and deliver a public lecture each semester. The recently approved mathematics doctoral program received 68 applicants for seven openings next fall, while early applications for undergraduate admission rose from 5,500 last year to 5,800. The University opened two package distribution centers on lower campus to serve the 4,490 students who live there. The economics department has added additional elective courses and faculty members in response to an increase in the number of majors. Interest in the field tends to rise in the wake of economic difficulties. 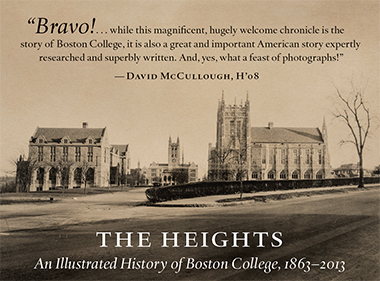 The Heights staff elected Matthew DeLuca ’11 editor-in-chief for a one-year term beginning in January 2010. The first editorials under the new administration praised the introduction of breathalyzers into the mix of research protocols that Health Services uses to assess student drinking, and critiqued the use of core survey courses “as training grounds for new professors.” Tracking the quality of those faculty and their more seasoned colleagues will be easier for students with the launch of a new teacher-evaluation system that delivers composite information on such measures as faculty preparedness, availability, and passion for the subject matter. The Boston College post office stayed in business, dodging federal budget cuts. The television program Friday Night Lights filmed portions of a forthcoming show on the middle campus. The much-abused Canadian band Nickelback was further battered by Heights arts editors who named five of its tunes to a list of the 10 worst songs of the Oughts decade. Over the course of 2009, the Career Center experienced a 22 percent drop in job listings provided by employers seeking Boston College applicants. The two-year-old Islamic civilization and societies major was one of 30 internationally focused programs to receive a grant ($180,000) from the Department of Education. Boston College’s chapter of the NAACP celebrated its 30th anniversary with a program that included reflections from Donald Garnett ’77 and Charles Smith, a retired professor of education. The Heights celebrated its 90th anniversary. The Long Run Economists, an aggregate of five faculty and graduate students, competed in the Mill Cities Relay and delivered a respectable 6:55 minute per mile pace over the 27.1 mile course. Psychology professor Michael Numan’s lifetime of research on the neurobiology of parental behavior in rodents earned him election as a fellow of the American Association for the Advancement of Science. Boston College’s endowment fell by 17.8 percent in the fiscal year ending May 31—from $1.63 billion to $1.34 billion. The average loss among the top 50 endowments in the nation (a list on which Boston College holds 38th place) was 22.3 percent. In better fiscal news, the Light the World Campaign achieved $640 million in cash and pledges toward its $1.5 billion goal. Boston College offered a voluntary retirement benefit of one year’s salary to non-faculty employees 65 or older who have been at the University for a minimum of 15 years. Some 70 employees are said to be eligible.